After NAMA in January 2013 sold its loan in the Treasury Holdings portfolio known as Opera, our interest in the fate of the 16 properties in the portfolio receded, but the ultimate sale of the properties or the loans underpinning the properties still gives us an insight into the Irish market, both the participants and prices. And this afternoon, the British commercial property portal CoStar claims that bidding for the assets has now been whittled down to three bids from our new philanthropic friends Kennedy Wilson, from Northwood Investors who bought the Bord Gais building on Warrington Place in Dublin 2 and from London and Regional. We don’t know the bids, but CoStar suggests that it is south of the €270.4m valuation of the assets by Treasury Holdings in February 2012. The assets include Merchants Quay shopping centre in Cork and the Stillorgan shopping centre. With commercial property prices in Ireland down 68% from peak, and still falling, I would say it is well south of €270.4m!The portfolio was originally valued at €375m. CoStar has detailed reporting on what might be Northwood’s proposal which includes €50m of new funding and a premium interest rate payable on any loans that remain payable to the lender, Hypotheken Bank in Frankfurt. Separately, NAMA is said byCoStar to have received just €100,000 from Northwood for its loans to Opera, loans which had a par value of €85m so the return was just 0.1c in the euro. In January 2013, the reporting was that NAMA had received a price equivalent to “single digits in the euro” but the impression was that it had received millions. CoStar’s reporting today, if confirmed, is sobering but probably reflects the floor for a mezzanine loan which offers a seat at the negotiating table. We have word this afternoon that NAMA has decided to appeal the decision of the High Court in February 2013 which upheld the decision by the Commissioner of Environmental Information, Emily O’Reilly, to designate NAMA as a public body. That judgment meant that NAMA was subject to environment information requests which would provide a modicum of transparency in the Agency to the general public. Gavin Sheridan at TheStory.ie has confirmed that NAMA is appealing the decision, and is, in addition seeking a stay on the High Court judgment which would mean that environmental information requests would not be permissible until the Supreme Court had held the appeal. As Gavin says, such appeals are taking in the region of four years – seriously four years, no wonder judges are concerned about resources and the reputation of the State. Tomorrow morning at 10.30am, Judge Mac Eochaidh is set to decide if he will impose a stay pending the outcome of the appeal. Gavin will be attending in person; NAMA is [AMENDED] making oral submissions. Judge Mac Eochaidh has a mixed history on transparency, he approved Paddy McKillen’s recent application for an injunction stopping the Sunday Times printing a story about him, but he was also the barrister whose advertisement in the 1990s started the planning corruption tribunals. The position on here remains skeptical as to the value of information that can be obtained under environmental information requests, but such requests can have unintended consequences. NAMA has spent €120,000 on resisting the Information Commissioner’s decision, originally given in 2011. Previously, finance minister Michael Noonan claimed his hands were tied when it came to influencing NAMA’s consideration of lodging an appeal. This was at the same time as we were learning that Minister Noonan had directed NAMA to make a €1bn credit line available to the utterly bust IBRC! If the judge tomorrow refuses the stay, then we might finally be free to submit environment information requests to NAMA. If not, then the whole matter, for all intents and purposes, dies because by 2017, information requests at NAMA might not be very helpful in terms of influencing its future actions. UPDATE: 17th April, 2013. Gavin Sheridan has reported on this morning’s proceedings on his TheStory.ie website which also includes a copy of his submission read to the court. The upshot is that Judge Mac Eochaidh has reserved judgment until Friday morning, 19th April 2013. You’re probably sick of all the press releases and advertising from KBC Ireland boasting about its recent decision to invest €125m in its Irish operations. And all the nauseating politicians, predictably demonstrating world-class goal-hanging by welcoming the investment. And just how many jobs will such investment generate in Ireland. You must be sick of hearing all about it. We know that KBC has recently acquired a premises for a new branch in Cork. But, €125m for expansion? KBC’s total operating costs in Ireland 2012 were €75m. And remember the €125m has already been “invested” in one hit on 27th March 2013 so this isn’t an investment spread over years. In 2011 KBC Ireland booked €525m in impairment provisions, in 2012 this rose to €547m. So €125m just looks like the quarterly replacement of capital after booking more losses on its loans – in August 2012 KBC invested another, completely separate, €125m in its Irish operation “to ensure the stability in the bank’s regulatory capitalization”, in other words to keep the bank solvent or at least acceptably solvent in the eyes of the Central Bank of Ireland. But in respect of the March 2013 €125m, KBC says no – it “was not a shoring up of the business”. We hear today that KBC’s Core Tier 1 capital at 31st December 2012 was an impressive “in excess of 11%”, compared with EU standard of half that. The Central Bank of Ireland does not comment on the capital position of individual banks. KBC has an unusual operation in Ireland. It has €14bn of lending to Irish households and businesses and €3bn in deposits with most of the bank’s funding coming from the parent company in Belgium. It had capital of just €1bn in December 2012 compared with assets of €17bn. Irish depositors are covered by a government guarantee for the first €100,000 of individual deposits and that guarantee is backed up by a €400m Deposit Guarantee Scheme fund held at the Central Bank of Ireland, though in the case of all of that being used, the Central Bank can impose additional levies on banks, like with the insurance industry. There is no suggestion here that KBC faces imminent threat and it should be said the parent company has expressed support in the Irish unit, but with impairments running at €500-600m per annum and growing, with three Belgians recently parachuted onto the Irish board, you would at least have to consider the future of the company in Ireland. NAMA is spending €2bn of your money investing in developments subject to loans to its developers – nothing new in that, NAMA announced that investment last May 2012. But trying to get any detail on that investment out of NAMA is generally like getting blood out of a stone. By a happy coincidence, and just as certain Northern Ireland politicians have been lining up to criticize the Agency after foreclosing on loans attached to the Kennedy Group, the Agency has today announced a GBP 9m (€11m) investment in a 95-unit housing development in Dundonald, south-east Belfast. And it is another coincidence still that the criticism of NAMA in the Kennedy Group foreclosure has been limited to politicians from the DUP – Messrs Campbell, Wilson and Paisley junior – and lo-and-behold, Dundonald is a DUP-stronghold, its British Member of Parliament is Jim Shannon of the DUP, and four of the six MLAs from the constituency in the Northern Ireland Executive are from the DUP. This is the first time that I can recall an announcement of a specific investment anywhere by NAMA in this way. Veterans of the Troubles who had engaged in extortion of businesses and protection rackets must be very impressed, though of course, there is absolutely no suggestion of criminality on anyone’s part here. The development itself is at the 96-acre Millmount site in Dundonald. And there will be some relief that the dithering over the development appears to be coming to an end. The site was originally owned by the Taggarts but was acquired – using loans from Anglo Irish Bank thought to be GBP 70m – by a partnership in which the Lagan Group featured. NAMA acquired the loans from Anglo and in 2011, had administrators Baker Tilly Ryan Glennon appointed to the site. The announcement today confirms that the homes will be constructed by …. Lagan Homes, part of the partnership that once owned the site. Of course we have no idea how much was spent on insolvency experts, administrators and various lawyers in the past two years, just to end up with Lagan developing the site. Separately, NAMA said that it was in discussions with a Northern Ireland lender to launch its 80:20 deferred mortgage initiative in the Province. With the Nationwide Building Society showing Northern Ireland’s housing increasing by 4.4% in Q1,2013, top of the UK league table, there mightn’t be great demand for a negative equity mortgage product at this point, but it’s all good PR. At this stage, all NAMA is saying is that the homes at Millmount might be offered with mortgages under this scheme. Does this loophole stop BoSI enforcing any loans in Ireland originally advanced by ICC? Remember ICC Bank? It was set up in 1933 by perhaps our greatest pragmatic politician Sean Lemass; originally called the Industrial Credit Company, it is akin to what the Labour party has been promising for more than two years, a strategic investment bank to loan to, and support businesses. In later years, it changed its name to the Industrial Credit Corporation PLC but by 2001 it was known simply as “ICC” when the Irish government sold it to Bank of Scotland. A serious problem has arisen for Bank of Scotland with enforcing loans originally advanced by ICC. It seems that some, if not all, property loans from ICC could only be enforced if a seal was placed on the deed of the property, by the bank. But guess what? The rules under which BoSI operates – set out in its Memorandum and Articles of Association – don’t require the bank to have a seal and it seems it doesn’t have one! This whole mess was recently aired in the High Court in Dublin – judgment here just now published. 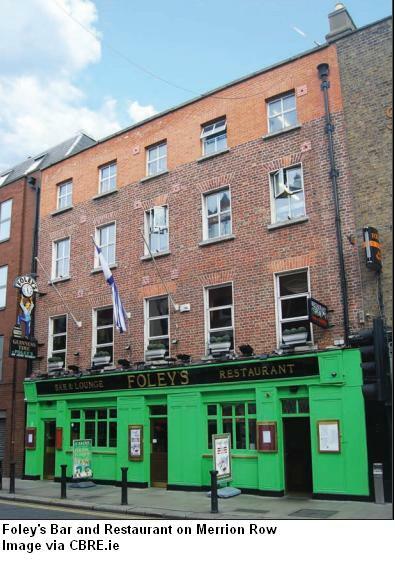 It relates to Foley’s Bar at 1 Merrior Row Dublin 2 which was security for a loan originally advanced by ICC in 1981. About €4m is now outstanding to BoSI which bought ICC in 2001 from the Irish state. BoSI had a receiver appointed late last year, and the pub was marketed for sale by CB Richard Ellis – brochure here – but the borrowers went to court to claim the appointment was invalid. And after six months, a court judgment means David O’Connor, the receiver, has been “stood down” and the borrowers have recovered possession of their pub. Now, BOSI seems to have two remedies, it may appeal the High Court decision and/or it may alter its Memorandum and Articles of Association, but for the time being, BOSI is exposed to a wave of legal action from other borrowers to whom it has had receivers appointed and current receiverships may be doubtful, though it should be remembered that this issue has arisen in the context of ICC’s loans only. The pub owners, ultimately Sean Foley and his wife Sherry Yan who control the two companies, The Merrow Limited and Belohn Limited, have taken back possession, have succeeded in having an interim examiner appointed to the pub and the matter returns to the courts shortly where full examinership will be sought. The judgment in March 2013 was reported in the old media – for example here and here – but its implication for other ICC loans was not examined. The borrowers were advised by Lansdowne Francs, accountants and debt advisers, based in Dublin and Belfast, and Seamus Sutcliffe from Lansdowne has said that he believes in 2012 alone, 15 companies may have had receivers appointed based on ICC loans and debentures. The judgment in March 2013 is believed to be the first time in the Irish courts that a receivership was successfully overturned, though as we have seen with the original NAMA appointment of receivers to the Grehans, it is not the first time that receivers have been stood down.